WHITMAN — Families spent a bright and sunny Columbus Day exploring fire equipment, target practicing with a brush fire hose and learning how to safely exit a house in case of fire as Whitman Fire and Rescue hosts open house. Nikki McCormack helps son, Cody McCormack-Sullivan, 2, with a drink of water while her eldest, Dillon, 4, enjoys his pizza as they picnic in the Whitman Fire/Rescue parking lot during Monday’s open house. CLICK ON IMAGE TO VIEW MORE PHOTOS. Photo by Tracy Seelye. Face-painting and free pizza from Papa Gino’s were also featured. But the main message of the day was the importance of placing smoke detectors in every bedroom of the home. Past guidelines called for the alarms in hallways outside of bedrooms, Deputy Chief Joseph Feeney said. The department will take the Safety Awareness and Fire Education (SAFE) trailer around to Conley and Duval schools for an offical fire safety presentation, but on Monday the kids were laughing and running into the trailer over and over to experience the “smoke” and climb down the escape ladder. Volunteers with the Community Emergency Response Team (CERT) were also on hand to guide visitors through their vehicle and explain their role. Joseph Bauer of Whitman and his children chatted with CERT members Cathy Costello and Paul Moss. Michael Bauer, 11, asked about the kinds of fires for which the CERT team offers support to firefighters. Costello said it could be anything from large brush fires to house fires. They also aid in large incident response, such as train accidents. Members’ availability is scheduled around work schedules, although some, like Moss, are retired. “We also do sheltering, so if you guys lose your power, we come in and set up a shelter to keep people warm,” Costello said. It’s no joke — come April 1, 2016 Whitman-Hanson Regional High School plans to become the latest school on the South Shore to host a Credit For Life Fair as part of a financial literacy program. WHRHS promotes Credit For Life as a way to increase student awareness of credit scores and the pitfalls of credit card overuse. WHRHS business teachers have attended Credit For Life Fairs offered at Brockton, Plymouth South and South Shore Regional Vocational Technical High School, where Whitman and Hanson students have been participating in the fairs during their senior year for a half dozen years now. The next planning meeting is planned for 6:30 p.m., Thursday, Nov. 5 in the high school library. The critical need right now is to have enough volunteers at each of about a dozen information booths to keep nearly 300 students circulating in order to complete the fair between 9 a.m. and noon. Brockton uses 80 volunteers for its fair. The Oct. 8 meeting kicked off with a YouTube video of a Quincy High School Credit For Life Fair, followed by a discussion of logistics and volunteer and resource needs. “We’ve been working very hard and this is the year we’re going to get it,” business teacher and DECA Advisor Nina Consolini said of the Credit For Life Fair. Some of the few parents attending the planning meeting, all of whom now work in jobs involving finance, noted that they graduated high school without working knowledge of how to balance a checkbook, and that little has changed. “I see people now that … the things they did years ago are kind of catching up with them,” said parent Peggy O’Toole, a financial planner. The fair generally begins in an assembly during which state legislators and educators speak briefly on the importance of financial literacy and how to fill out paperwork. State representatives Josh Cutler, D-Duxbury, and Geoff Diehl, R-Whitman have already committed to appear as keynote speakers during the pre-fair assembly. Cutler’s district includes Hanson. Students are provided a fictitious job and income profile, then report to a gymnasium — or, in some cases, a hotel ballroom when the fair is held off campus — where they circulate among stations to learn lessons about budgeting for housing, transportation, insurance, retirement, food and other costs of living. They must balance their budget with the main credit counseling station, staffed by representatives of a partnering bank, before they finish. That is one of the key volunteer needs for the W-H Credit For Life Fair at this stage. HarborOne partners with schools in Brockton and Plymouth and Rockland Trust partners with SSVT, for example. Students generally dress professionally, often as a requirement set by the school. WHRHS Junior Achievement Heroes already sends Business Honor Society members to first and second-grade classes to teach financial literacy. W-H also offers a financial literacy elective, but educators see the need for a broader program. A bill now before the state Senate — S279 introduced by state Sen. James B. Eldridge, D-Acton — and supported by Nelson could even make high school financial literacy programs mandatory. Nelson testified in support of the bill during a public hearing last month. Other schools might handle it differently. SSVT, for example organizes the Credit For Life Fair through its Mathematics Department to instill financial literacy. In Virginia, according to Nelson, it is taught across the curriculum. HANSON — With one of three finalists withdrawing for personal reasons, the Town Administrator Search Committee Tuesday night recommended, and Selectmen agreed, that the job be re-posted with a $10,0000 increase in salary range — pending Town Meeting approval — and a more detailed job description and outline of benefits. The current salary range is $95,000 to $110,000. The Search Committee would like to see it increased to between $110,000 to $120,000. Hanson Town Administrator search continues as the Search Committee, which has not released information about the finalists, would like to retain the remaining two as it renews the posting. Interim Town Administrator Richard LaCamera said he would check with town counsel to see if such a move would be permitted. LaCamera supported that position, while he doubted it would be permitted to hold the remaining two finalists. “You’re certainly doing the right thing by not making them public because it’s not fair to them,” LaCamera said. Selectmen, after the meeting, said that they don’t know who the three finalists were despite discussion around town regarding their identities. “I don’t want to know at this point,” Selectman James McGahan said, indicating he preferred to await an official notification from the Search Committee prior to the board’s interviews with finalists. The first search brought in 22 applications, from which four were invited to interview and the three finalists were selected. One of the four had voiced issues with job description and qualification matters so he withdrew, followed by one of the finalists as the committee was preparing to present a list to Selectmen. One option discussed in an executive session of the Search Committee Tuesday was to start again. The other option was to go with the remaining two finalists while posting for additional candidates, which they decided to recommend to Selectmen. “We don’t want anything less than three,” McCormick said. McCormick admitted that is a concern. In other business, Selectmen voted 5-0 to hire Leah Guercio, 164 Reed St., as Assistant Supportive Day Program Coordinator at the Senior Center. LaCamera and COA Director Mary Collins both recommended Guercio, who has 30 years’ experience as a nurse, for the post in the program where she has been a volunteer for five years. Collins lauded Guercio’s compassion, sense of humor, common sense and experience. Two area state representatives will face off, along with unenrolled candidate Anna Grace Raduc of Halifax, on Tuesday Nov. 3 as they vie to fill the 2nd Plymouth and Bristol District seat left vacant by the death of state Sen. Thomas P. Kennedy, D-Brockton, in June. this positions Geoffrey Diehl to face Michael Brady and Anna Grace Raduc. State Rep. Michael D. Brady, D-Brockton, handily defeated businessman Joseph Lynch, also of Brockton, in the Tuesday, Oct. 6 special state primary. Brady took about 90 percent of the Democratic votes. State Rep. Geoffrey Diehl, R-Whitman, was also on GOP ballots, but faced no opposition. There were no candidates listed on either the Green/Rainbow or United Independent Party ballots in Tuesday’s primary. Voters may also have been looking ahead to November as both Whitman and Hanson saw a turnout of about 3 percent of registered voters cast ballots. In Whitman, where 384 of the town’s 9,631 voters cast ballots, Democrats backed Brady with 141 votes to Lynch’s 29. Hanson saw 232 of about 7,000 voters turnout to give Brady a 115 to 15 win over Lynch. The margin was similar throughout the district. Brady garnered 2,533 votes in Brockton, 94 in Easton, 88 in East Bridgewater, 49 in Halifax, 219 n Hanover and 18 in Plympton. Lynch received 355 Brockton votes, 12 in Easton, 8 in East Bridgewater, 7 in Halifax, 33 in Hanover and 2 in Plympton. Neither Brady nor Lynch were available for comment on the primary result, but Diehl, who received 96 votes in Hanson and 208 in Whitman expressesed gratitude to voters. He also stressed the differences between his tenure as a representative for the 7th Plymouth District he has served since 2010 and Brady — the 9th Plymouth representative for seven and a half years. While Brady is strong in Brockton where he has served on the school committee and 13 years as a city councilor, Diehl’s best chance is considered by political observers to be centered in the surrounding suburban communities. HANSON — Hanson approves Selectmen restrictions as new by-law will be added to the books preventing paid Hanson town employees from running for a seat on the Board of Selectmen. The by-law extends to prohibit office holders from working as paid employees for one year after leaving office, grandfathering in those already elected. Voters at special Town Meeting Monday approved by a vote of 58-48, the measure — warrant Article 25 — proposed by selectmen. 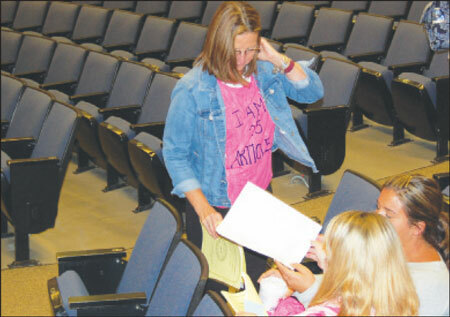 Wearing pink T-shirts emblazoned with “I am Article 25,” hand-written in fabric paint, Building Department Administrative Assistant Anne Marie Bouzan and a handful of other Town Hall employees, made a statement against the proposal from the audience. Bouzan, also a union steward who ran for Selectman this spring, spoke vigorously against the article. After Town Meeting adjourned, Bouzan expressed disappointment at the vote, but suggested she wasn’t through with the fight just yet. Selectman James McGahan said after the session that he understands it is already hard to fill some elected positions, but said the by-law is necessary to prevent potential conflicts of interest. He did say that he thought Bouzan would be an excellent selectman. Bouzan had stressed during debate on the article, that she had consulted the State Ethics Commission before running for a seat on the Board of Selectmen. The lawyer had, verbally and via email, informed Bouzan that she could serve as selectmen without conflict so long as she not participate in discussions or votes on matters in which she had personal financial interests, although she could participate in collective bargaining negotiations in her role as union steward. Selectmen Chairman Bruce Young countered by asking if Bouzan had informed the Ethics Commission that she sits across the negotiating table from the town administrator during contract negotiations. Moderator Sean Kealy then cautioned against getting bogged down in debate over the specific situation that gave rise to the article. “I prefer to talk about this article on its own without getting into a rehash,” he said. 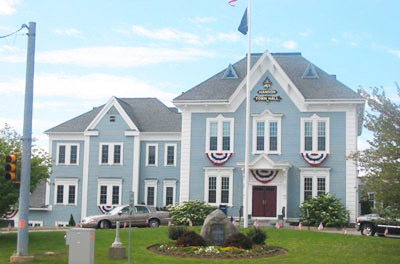 Resident Laura FitzGerald-Kemmett of 83 Bay State Circle noted that state ethics laws are very clear about conflicts of interest and asked Town Counsel Jason R. Talerman if the article is necessary and whether school district employees are included as “town compensated” positions covered by the by-law. Talerman declined to voice an opinion, but noted there are parts of the by-law covered by state laws. McGahan said school district employees were not included in the by-law. While Talerman said he’d have to look more closely at the regional agreement, but tended to agree with McGahan’s interpretation. John Norton of 31 Indian Path agreed, noting that out of more than 7,000 registered voters in town, it is already hard to attract people to the idea of running for public office. Resident Tom Dahlberg of 66 Hillcrest Road agreed with McGahan. Talerman, who said there are varying versions of the proposed article in place across the state, but couldn’t say how many of the 351 communities in Massachusetts have them. “It’s not uncommon to go beyond the conflict of interest laws and place limits on whether people can hold two elected positions or an elected and appointed [one],” he said. A proposal to amend the article to allowing a minimum of one seat on the Board of Selectmen to be held by a town employee was declined. HANSON — Korea is called the Forgotten War as it was, and remains, a stalemate paused by a lingering cease-fire that many political and military leaders wanted to put behind them. But the families and hometowns of the Korean War’s wounded and fallen have never forgotten, even when honors were delayed. On Saturday, Sept. 26 Hanson saluted Army Sgt. James F. “Red” Harrington, who was killed in Korea on April 8, 1951. 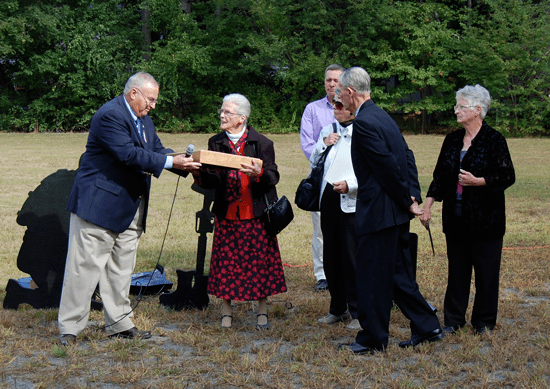 Selectmen Chairman Bruce Young said it was a day for which Hanson could be proud. “It’s a nice hometown, small town event where people get together and get united for an effort to honor somebody who gave his life in defense of freedom for others,” Young said. Like many who served in Korea, Sgt. Harrington was a veteran of military service, having joined the Army in 1946 and served two years before going on reserve status. During his junior year at Boston College in 1950, he was recalled to active duty and sent to Korea in January 1951. Saturday’s program, held at 10 a.m. on the ball field, began with bagpiper Don Teague playing a selection of service hymns and other selections, including “Scotland the Brave,” before Veterans’ Services Director Bob Arsenault began the ceremony by introducing Croghan and her surviving brother and sisters, Jack Harrington, Rose Dunlea and Mary Tucker. Members of the Tech. Sgt. Elmer R. Hammond American Legion Post 226 Honor Guard also took part in the ceremony along with Young and fellow Selectmen Bill Scott, James McGahan and Kenny Mitchell. Arsenault outlined the all-too-brief story of Sgt. Harrington’s service in Korea, where he had volunteered for the mission of forward observer. Jack Harrington spoke for the family during the emotional program, quipping that he had prepared a 10-page speech about his big brother. He noted a tragic family lineage of sacrifice for country — his maternal great uncle, Sgt. James F. Healy, was killed in WWI; a cousin, Sgt. James F. Healy was killed in WWII and his brother, James F. Harrington, was killed in Korea. His mother asked her remaining children not to name their sons James F., he said before introducing his oldest son, James F. Harrington, to applause. “They say the good die young — I’ll live to be 120,” Harrington said. “But James was surely good. He was good looking, good at football, good at basketball, good at baseball, good at fishing, good at studying. He was good to his mother and father, his sisters and his brothers. Harrington said the letters in Red’s nickname stood for regular (conforming, straight), educated (cultivated, disciplined) and dependable. Arsenault read citations in honor of the dedication from the General Court of the Commonwealth and Gov. Charlie Baker before presenting an American flag in a shadowbox to the Harrington family on behalf of the president, governor and citizens of Hanson. He thanked all those who helped make the ceremony possible, including Highway Surveyor Bob Brown and his crews, selectmen, Sons of the American Legion, Mike Means and Bob Hayes. Sgt. Harrington’s siblings then threw ceremonial first pitches to four children, symbolic of renewed life for the old ball field. More photos from the event can be viewed on the Whitman-Hanson Express Facebook page. WHITMAN — The price tag for trash pickup is going back up to $250 a year per household in fiscal 2016 beginning immediately — it had been reduced to $225 last year. Selectmen approved the increase by a 4-0 vote Tuesday, Sept. 29 on the recommendation of Town Administrator Frank Lynam, who explained the cost quotes received from other haulers in the wake of DelPrete’s bankruptcy have all been higher than expected. Selectman Scott Lambiase was absent. Lynam has said he hopes that amount will be enough to cover services while a new contract with the present hauler is negotiated as service continues, but voiced doubts about that Tuesday night. A new contract is expected to be in place by December or January. “To tell you the truth, I’m not happy,” Selectman Dan Salvucci said. He said it is becoming more difficult to find companies that will take solid waste and recycling market has bottomed to the point that the town has to pay a tipping fee for it. EZ Disposal of Revere, a division of Capitol Waste Services Inc., has been providing waste hauling services to the town since June. The company has proposed moving to an automated system, such as is used in Abington. The trucks are fitted out with a mechanical device that lifts barrels to empty them into the truck. Lynam said that, regardless of which firm the town contracts with going forward, the town will be looking at the barrel change associated with automated pickup. Each household would be provided two 64-gallon tubs, both equipped with lift-bars, which current barrels do not have. One trash barrel and one recycle barrel are included. The new barrels carry serial numbers that will be assigned by household. Selectmen Brian Bezanson asked if the current pink Breast Cancer Awareness barrels, with a similar lift-bar could still be used. There will also be a charge for the one large item per week that has been picked up free to homeowners, with one contractor proposing a $20 fee, but Lynam hopes to negotiate it to $10. In other business, both Police Chief Scott Benton and Fire Chief Timothy Grenno gave their monthly department updates, reporting that call volume continues to be increasing this year over 2014 levels. Benton said call volume is currently 9,163 against 7,351 last year. Current all other services expenditures are also up by $38,874.78, mainly due to a union contract raise and increased training. Expenses are lower by $4,693.44, however, and utility costs are down $691.60 but winter and another expected increase in electricity rates will likely reverse that trend. Grenno reported costs for his all other services budget are up by about 1 percent, due to vacation coverage. One firefighter is also out on an injury and two others are or will be out on family medical leave. Call volume is up to 2,074 or 187 more than the January to September period in 2014. The fire station has been empty 234 times, or an average of one time per day for a period of from 10 to 20 minutes — generally one or two times per day — due to the call volume. General medical calls, with no chief complaint, account for the majority of EMS calls, Grenno said, followed by psychological or behavior issues and orthopedic cases. This year, however, fire calls are outpacing medical calls. Grenno also said his grant and capital lists include the goal of purchasing a new Jaws of Life as the current one needs replacing. 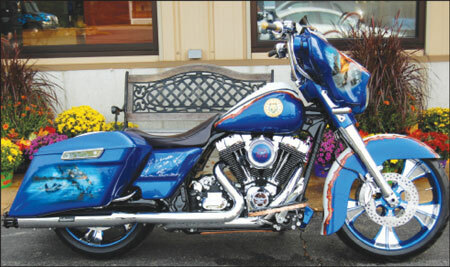 ROLLING HONOR: Whitman businessman Mark Shadley customized this Harley to salute Medal of Honor recipients. Photo by Tracy Seelye. WHITMAN — When someone calls on you to help honor the nation’s Medal of Honor recipients, you answer the call. So when Mark Shadley of Auto Tec/Shadley Bros in Whitman was approached by Massachusetts Fallen Heroes to create a motorcycle to make that salute, he readily agreed. The Congressional Medal of Honor Society’s convention met it Boston last week, where the society’s 79 members were asked to sign parts of the custom Harley-Davidson. Whitman sign company owner Gary Heager did the artwork, which included graphics of valor in action from the Massachusetts Fallen Heroes’ website, barbed-wire trim design to salute decorated POWs and copper accents fashioned from brightwork that came from the USS Constitution. The bike was displayed during the Medal of Honor Convention at the Seaport Trade Center and will be placed on permanent display in a memorial being built next to the Moakley Federal Courthouse. The bike started out as a 2015 FLH-X, valued ad $21,000. Shadley said it’s value is now closer to $50,000. They took the engine apart to diamond-cut the cylinders. Direction-signal housings are designed from large-caliber bullet casings and the front features the campaign ribbons of all service areas represented by the Medal of Honor recipients as well as three depictions of the medal itself. It also features the seals of the Medal of Honor Society and the Massachusetts Fallen Heroes. 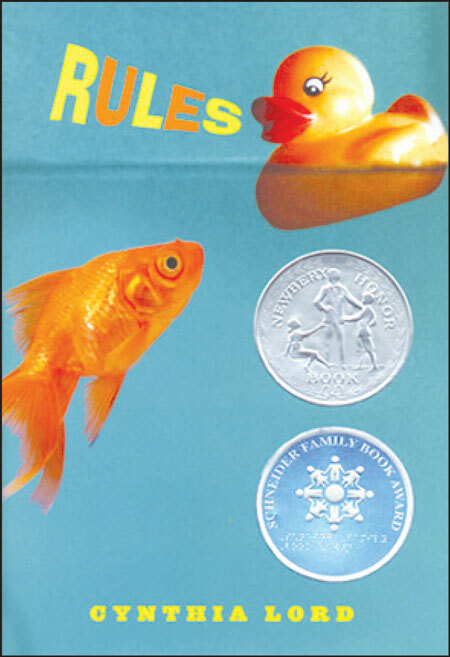 A MILE IN OTHER SHOES: Cynthia Lord’s book, ‘Rules,’ was a school-wide reading project this summer. Courtesy image. HANSON — In a way, summer vacation lasted a few more weeks for Indian Head School students than others in the W-H district. They just last week enjoyed the finale of a school-wide summer reading project between Indian Head students and the Maquan School second-grade pupils promoted to third grade at Indian Head. Newbury Silver Award-winning author Cynthia Lord visited the school on Thursday, Sept. 17 to talk about her life and work as a writer. Students read Lord’s book, “Rules,” about autism and acceptance of differences over the summer. “Because we house the autism program for the district in this building, we thought it would be important to have a book like that,” Principal Diane White said on the last day of school June 25. Lord began her visit at an assembly of all three grades before meeting with students in each grade level separately. It was Lord’s second school visit in as many days in Massachusetts. The Maine resident and former teacher spent the day at a middle school in Blackstone Wednesday, Sept. 16. To illustrate the writing process, she led the children in the creation of a story. Grade four was up first, as the students learned that becoming a writer is a little like the old joke about how you get to Carnegie Hall. Her slide presentation began at her own beginnings — a one-page story she wrote in the first grade. She asked the boys and girls for the titles of the books they just couldn’t put down. There were few duplicates as she called on several among the large number of students raising their hands. Lord also made sure that they knew writing, like many other skills, takes practice and a willingness to learn from your mistakes. “Cynthia would rather stare out the window than get her work done,” it read. The book was published April 1, 2006, but it started when her 12-year-old daughter Julia, now 25, asked her a question: “Mom, how come I don’t ever see families like ours in books?” Lord’s son Gregory, now 23, was diagnosed with autism at age 2. There were some out there at the time, but Lord felt the stories about autistic characters were sad. Her audience had evidently read her book very closely, asking thoughtful questions about the story and answering her question in detail. Some students were touched more closely by the book than as a fan of a good story. One student told Lord that her heroine Katherine’s love of art inspired his passion to draw. “My brother has autism, so when I read the book it made me feel really good that someone wrote a book about autism,” another boy said. He also told her that he’s working on his own book series called “Superbacon,” the inspiration for which came to him over breakfast one morning. His friends thought that sounded really cool. Lord agreed. The boy’s first “Superbacon” story won first prize in a writing contest. After her grade four presentation, Lord was surrounded by students eager to speak with her. She was equally impressed by them. The show’s humor is an effective tool toward helping foster acceptance of autistic people, she said. Children can also take a leadership role in that acceptance. WHITMAN — The Board of Selecmen has adopted a resolution accepting the Old Colony Region Natural Hazard Mitigation Plan, developed for the Brockton-based Old Colony Planning Council’s (OCPC) 15 member communities. OCPC Community Planner Eric Arbeene and Council member Fred Gilmetti outlined the plan for the Board of Selectmen at its Tuesday, Sept. 15 meeting, broadcast on Whitman-Hanson Community Access TV. The plan was financed by a FEMA grant in 2010 with the aim of updating a plan done in 2006. Because of the logistical problems, Arbeene said the next plan will not be multi-jurisdictional, but instead an individual town plan, which the state prefers. That will happen when the 2015 plan expires in 2020. “I strongly urge the community, about three years from now, to start updating this plan,” he said because, while FEMA quotes 45 days as the typical time taken up by the process, Arbeene said it typically takes eight months. FEMA and the Massachusetts Emergency Management Agency (MEMA) have approved the current plan, Arbeene said. There is, he stressed, no penalty for falling short of accomplishing all the identified tasks, as the agencies are more concerned with ensuring that the town is actively addressing them. Hazard mitigation plans are designed to avoid problems before they become emergencies to be addressed by emergency management plans, he explained. Improvements to culverts that are prone to overflow before they undermine a roadway is one example of a mitigation project. The Disaster Mitigation Act of 2000 encourages adoption of the plans and the state and most communities — whether independently or as part of a multi-jurisdiction group such as the OCPC — have mitigation plans in place, according to Arbeene. Adoption of the plan makes a community eligible for competitive grants to improve identified hazards. A grant period is now open through which the town may apply for a grant for a backup generator at Whitman Middle School, which is also an emergency shelter by adopting the plan. “You focus your resources on your greatest vulnerabilities,” he said. The plan identifies “anything that could possibly happen” in the region, even rare occurrences such as earthquakes and tornadoes, as well as a risk assessment. “We worked with the fire chief, the police chief and folks here in town to identify what are known as critical facilities deemed essential in an emergency,” Arbeene said. It’s an open-ended definition that, in some places includes churches as well as hospitals and DPW facilities. Flood zones, hurricane tracks, wildfire risks and other potential treats were then mapped and overlayed on a map labeling the critical facilities so an action plan can be formed. “Mitigation strategies are the heart of the plan to reduce loss and risk,” he said. Selectman Dan Salvucci said the Whitman Emergency Management Agency is very active and adept at identifying risk areas in need of mitigation. But he welcomed the added benefit of the regional plan.